When trying to obtain the (non zero) audio delay from an AVI file through ffprobe, 0 seconds is the result. Same result in Linux and Windows. ffprobe -show_entries stream -i "(My_AVI_file_path)"
Is there a way to obtain the audio delay via command line? Please test current FFmpeg git head and please provide an input sample file. Unfortunately the original AVI file is 1.98Gb length, unless you point a way for me to upload it. I've tried to trim it and get a shorter test file to upload, but the operation doesn't inherit the strange delay property. ...I get an invalid video, with the delay "burned" and clearly audible, in spite of the copy order, that should keep it intact. In the input file delay is not audible. Somehow the metadata that informs about the delay is cleared in the trimming process (and in any process, I dare to say). Depending on the tool used to trim, sometimes the delay gets burned in (ffmpeg, Avidemux), and sometimes not (because corrected by the tool, as Handbrake). But always the final result looses the metadata about the delay info, that is the one we want to measure with ffprobe. ffmpeg generally cannot be used to trim files, use dd. Finally I got a clean test file, thanks for the trimming idea. 2-Play it. Note that in t=00:00:28:345 audio pronounces the word: "TOKYO". This is the correct time where it must appear. (An error appears at the end, caused by the trimming operation, I don't think its critical). 4-Play "TEST2.AVI" and note that the word "TOKYO" appears at t=00:00:25:800, i.e. 2.5 seconds before it should. Compressed video gets unusable! So there must be a hidden delay in the original AVI file that neither ffmpeg can't see nor ffprobe, as states this ticket. The conversion needs -async 1 (or an equivalent audio filter) because audio is missing. Are you sure that the avi header explicitely contains the delay? For both streams in your provided sample file, strh->start is 0. Are you sure that the avi header explicitely contains the delay? 1- When processed through ffmpeg, audio rewinds 2.5 seconds back from its correct position. 2- Incidentally Media Player Classic also informs about a 2.5 seconds delay. Please see this capture: ​https://i.stack.imgur.com/bl7CI.png These is the delay I expected ffprobe to inform me. Thanks for the tip, I will test it. 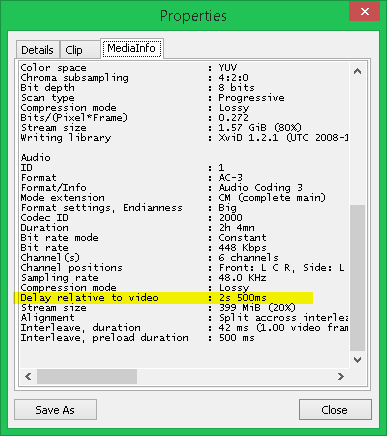 The symptoms only indicate that FFmpeg (and other software) is able to correctly read the initial timestamps of the file, but their difference is not what multimedia developers usually call delay.